Freebird Live originally opened as Freebird Cafe’ on September 8th 1999. Offering the combination of a music themed eating establishment adorned with a rare private collection of Lynyrd Skynyrd memorabilia and a live music venue all under one roof. Serving lunch and dinner with continuous recorded music and also featuring live music 7 nights a week. A few years later the Cafe’ was phased out and the venue was renovated to accommodate larger bands. With our total focus on live music, the name was changed to “Freebird Live”. Today, most of the Lynyrd Skynyrd memorabilia has been replaced with various music related decor. 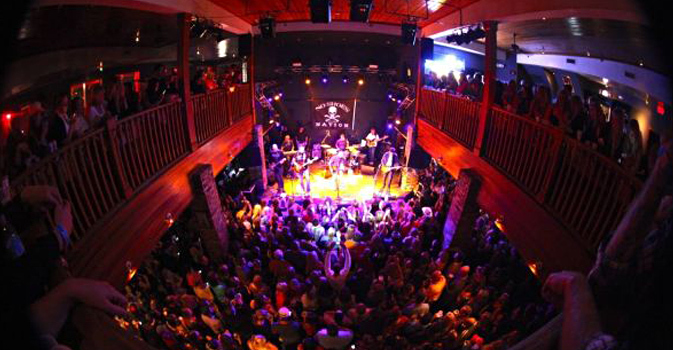 After 16 years in Jacksonville Beach, Freebird Live has evolved into one of the country’s premier live music venues. Showcasing a spectrum of national and regional touring artists, as well as, select inspiring local artists. Freebird Live provides a unique up close experience with the performing artists along with a variety of genres to satisfy your musical interests. Freebird Live features the latest state-of-the-art sound and lighting systems. A non-smoking two story music venue with a current capacity of 700 with 2 full bars, a unique railed balcony overlooks the ground floor stage. In addition, the venue features an open-air, exterior wrap around balcony designated as the smoking area. Freebird Live is a general admission, standing room only music venue. Stay tuned… Bookmark our website and visit us often to discover who will be performing at Freebird Live next! Thanks for stopping by, come on out and enjoy some great live music, we look forward to seeing you soon! Freebird Live officially closed their doors on January 21st, 2016. Freebird Live has been a staple in the community for over 16 years. Their final show was January 20th, 2016 with Galactic! Our on-site parking is limited and reserved for performing artists. Like most downtown businesses, we rely on street parking, free and paid parking lots. There are several parking lots near Freebird Live. Please do not stop your vehicle in front of Freebird Live to buy tickets at our Box Office, this is dangerous, illegal and causes problems for surrounding businesses. Send us an email with details of the type of event you’re planning, requested date and contact number. We’ll get back to you shortly. We appreciate your questions & comments. Please realize we receive many email inquiries and will only reply to those we can provide answers for that are not already posted on our website.